First & Limited Edition Designs - Ready to ship! Hair Today, Gone Tomorrow - Last Chance! Susan's Closet - Discount Designer Fashion! Collectors Club - It's FREE! 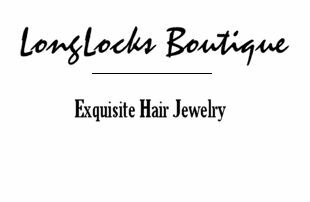 Style & Angst - The LongLocks Blog! Our jewelry display cases are a perfectly elegant way to store and display your collection of one-of-a-kind LongLocks HairSticks. Each display box is finished in beautiful black leatherette, has a clear acrylic lid for easy viewing of your hair treasures inside, two secure front snap closures, and includes one ten-compartment interior tray with soft, black flocking to show off your art jewelry collection in style. 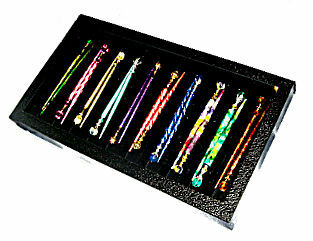 Each case is capable of holding two trays for storing a total of twenty LongLocks HairSticks designs, an additional flocked tray may be ordered separately. The case measures approximately 8 1/2" by 1 1/2" by 14 3/4" and will accomodate any LongLocks HairSticks designs currently offered in the boutique except our extra-long LongLocks RapunzelStix. 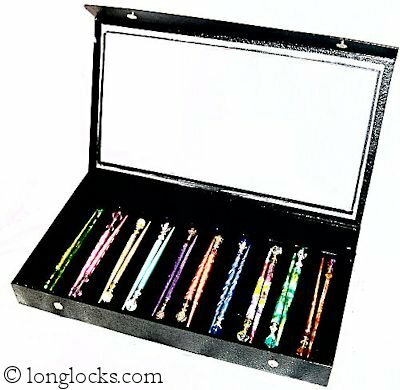 These very elegant display cases make lovely gifts for LongLocks HairSticks Collectors, and may be used to store and protect other jewelry, such as bracelets and necklaces, as well! Domestic Destinations: Both jewelry display cases and trays ship domestically via Priority Mail only, and do not qualify for free shipping. We are always happy to include shipping of additional trays or jewelry items in the same package at no extra charge. Please be sure to select "Display Case" as your shipping method during checkout. International Destinations: Shipments of cases and trays are made via Global Priority Mail whenever possible (and via Airmail Parcel Post when Global Priority is not available), at an approximate rate of $38 per package. Additional trays and jewelry items may be added to each international shipment at no extra charge. Please choose "International Destination" as your shipping method in the secure shopping cart and we will adjust the total before processing your order. Shipping fees to all destinations will be adjusted for multiple display cases as appropriate. Members of the LongLocks HairSticks Collectors Club are the elite among our international clientele. Although membership is entirely free, it entitles those serious about collecting one-of-a-kind LongLocks hair jewelry designs to discounts on virtually every boutique purchase, free or discounted domestic shipping, exclusive access to private sales and style previews, and the advantage of earning complementary gift certificates as you build your collection. Join today and enjoy the perks of being a LongLocks insider!